This post will help you answer this question – and it includes the tool “SFE Funds Finder”. Through an informal or formal assessment, you’ve found sales improvement needs. HR and Sales leaders will often tie funding to the type of improvement. For example, if it is a talent or learning improvement, HR will pay. If it is sales process improvement, Sales pays. And if marketing-related sales issues are being fixed, Marketing foots the bill. However, most of these department budgets are already allocated or near depletion. This is true especially at this time of year. There is a way to get the funding you need. Download the SFE Funds Finder for 51 ideas of funding sources. I mentioned department-aligned efforts (HR = Talent or Learning; Marketing = Lead Generation or Sales Enablement; Sales = Sales Process or Sales Management.) But many SFE efforts have cross-organizational components. Funding should come from a Process Improvement/Six Sigma center, or even a Project Management Office, if you have such. Without one, Sales and HR should work to find funding. Ignoring the politics and artificial budget-induced walls is tough, but needs to be done. I advocate that it is a company-wide effort to improve sales. Improved sales feeds improvement to the rest of the organization. So, find funds from wherever you can. Here’s an example scenario. A company wanted to implement a buyer-aligned sales process. They were convinced the results would bring greater sales performance. They wanted to engage a leading SFE consulting firm (SBI!) Funding from the sales budget would not fly – it was only sufficient for the rest of the year. They got creative and added a SPIFF. But, the SPIFF incentive didn’t completely go to the sales rep. A percent of SPIFF incentive was held back for funding the SFE effort. Don’t get me wrong – it wasn’t so easy to do. They first had to sell the benefits of the improvement to the sales force. After selling the benefits, they pointed out a lack of funds to implement. Then they introduced the SPIFF – which had sales force input in its design. It was like this: “A new sales process will improve your personal earnings, et al. We want you to have this new world. But, we don’t have funding for it. So, can you help us help you through a new SPIFF? The way it will work is…” Told them of a better world, pointed out it can’t be had, asked for help in getting there. Another company would contract external sales trainers for annual and ongoing sales training. They decided instead to have some of their Sales Managers be part-time trainers. They would record the training events for future use. This saved them enough money to fund an initiative to improve new hire onboarding. A major benefit from this approach also resulted – the training had a much better uptake amongst the sales force. Why? Because they heard the content delivered from a colleague who knew the context. No, the Sales Managers weren’t as polished as external professionals. But, they got better and received two major benefits in the exercise. One was they learned how to effectively present training – by weaving real-life, company-context stories into the content. Another benefit was during their preparation. They had to learn and internalize the content they were instructing. This made it easier to teach the concepts to their own teams – and reinforce adoption. I’ve given just a couple of funding ideas. There are 51 ideas in the SFE Funds Finder. Not doing anything has a cost. Waiting too long will put you in a market-trailing position. Here’s how to get action on improvement needs now. 1. Decide on the priority of your SFE improvements. 2. Determine how much funding your SFE improvements require. 4. Choose funding source(s) and quantify how much funding can be provided. 5. Communicate the future benefits of the improvement, especially if funding involves sacrifice. 6. Get the improvement initiative going as soon as possible. One more thing – ensure whoever you hire is using an agile approach. The nature of an agile approach will get you results faster. SBI leverages the agile approach in all of our engagements. 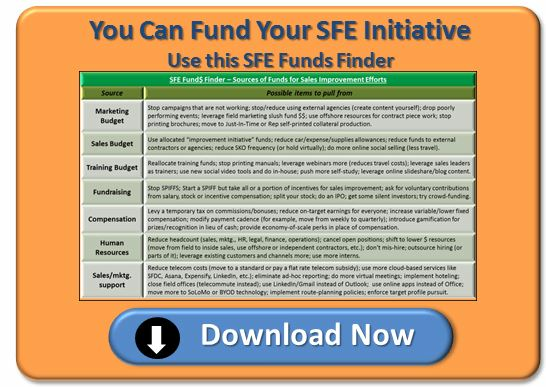 Download the SFE Funds Finder tool to learn 51 funds-sourcing ideas. Don’t let funding be an obstacle to improving your sales or marketing force. Image courtesy of freedigitalphotos.net -> sdmania.